As the new school year quickly approaches (or for some, has already begun), teachers are thinking and planning for those first weeks in school. Teacher stores are overflowing with welcome banners and signs announcing the arrival of caring kindergartners, stupendous second graders, or the next crop of quality first graders. In each of these cases the ultimate goal is to set the scene for creating a community of learners by labeling them in positive ways. The banner titles that keep popping into our heads have been influenced by the recent Olympic games and sound something like, Welcome World Class Students or Class 1-141 is Going for the Gold! or Meet the Next Dream Team! But there is more at play here than simply coming up with catchy titles or headings. The Olympics can provide a backdrop for what teachers always want for each year’s class: to become a great team and to aspire to be the best they can be. The motto of these Olympics, Inspire a Generation, is one we can carry forward with us into this new school year. In event after event, what kept being highlighted was how, regardless of the sport, each participant had a passion that they pursued, saw in themselves potential and possibility, and with the help of others, persisted and practiced intensely. This combination of process and effort is what we want to instill in all young people. The 2012 Summer Olympics can help us do just that. They are also called the Olympic Games and games are supposed to be not only challenging, but fun. One of the most memorable aspects of the games was the shear joy on the faces of so many of the athletes. Sports Illustrated (Aug. 13, 2012) even dubbed the women’s U.S. swim team “The Fun Bunch,” because they hugged and smiled before their races! They approached each race with “joy and camaraderie.” This may be an even more important lesson to learn from these games considering the current climate in education. Competition is tough and rough, but when done with joy and a positive attitude, it can also become a positive, life changing experience. Providing children with challenges to aspire to, while coaching them along every step of the way, and bringing some fun into the mix can change their lives as well. With this in mind, we will show you a few ways the Olympics have inspired our own joyfully made charts, that will hopefully inspire you and the students in your classrooms. Last week we had the pleasure of working with teachers from around the world at the Teachers College Reading and Writing Project’s August Reading Institute. Perhaps it was because the Olympics had just started and the games were playing in the background as we planned for our sections, but Olympic lingo kept seeping into our lessons and our charts. The first part of preparing a chart is to think about the big idea you want to teach and to find a heading that captures that idea. 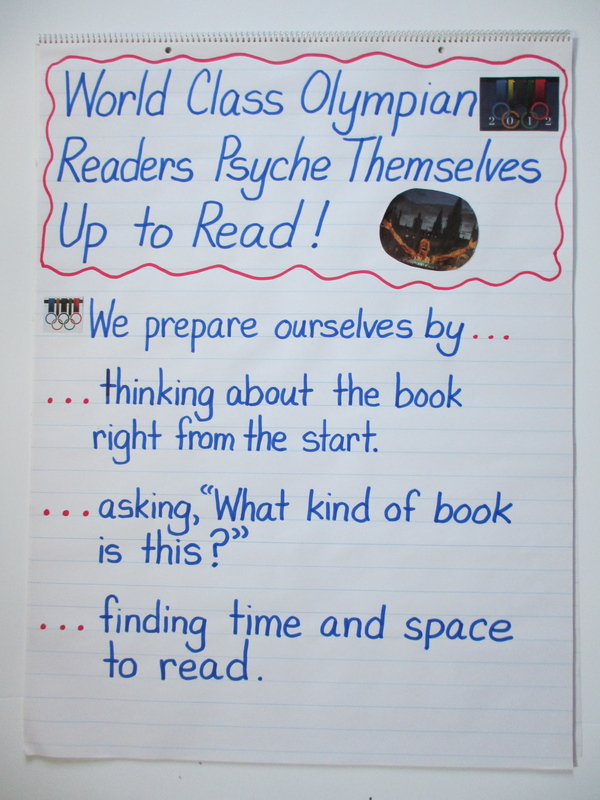 One beginning lesson was about encouraging readers to set themselves up for reading by getting their minds on fire. Watching the Olympic athletes prepare for their events, we noticed that they too got themselves psyched up. Michael Phelps put on headphones, hood up, head down. Jordyn Wieber acted out each move of her gymnastic routine prior to beginning. We want our readers to psyche themselves up in similar ways. This lead to the chart below with the heading, World Class Olympian Readers Psyche Themselves Up to Read! Now, rather than writing this heading in front of the students, especially if you want to include photos or pictures, you can prepare this part of the chart ahead of time. If you fear crooked writing and messy mistakes, you can also prepare the bullets ahead of time, as well, and then reveal the parts that match each day’s teaching point as you go along. The heading on this chart was inspired by observations made watching Olympic athletes prepare for their events. This chart was prepared ahead of time in anticipation of the series of lessons the teacher planned to teach. The next series of chart photos show how the chart was unveiled and used to reinforce the teacher’s teaching focus each day. It is important to point out that while the overall chart was prepared ahead of time in this case, it was not shown as a whole to the students. In fact, each bullet was taught into explicitly on separate days by breaking them down into steps. The teacher uses the heading of the chart to help her introduce what she wants to teach and to engage the students in the topic by using a metaphor they might connect with. 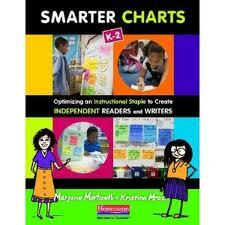 Next, the teacher folds down the chart to reveal the first strategy she plans to teach for setting up to read. The first strategy is revealed, but not the “how” to do it. 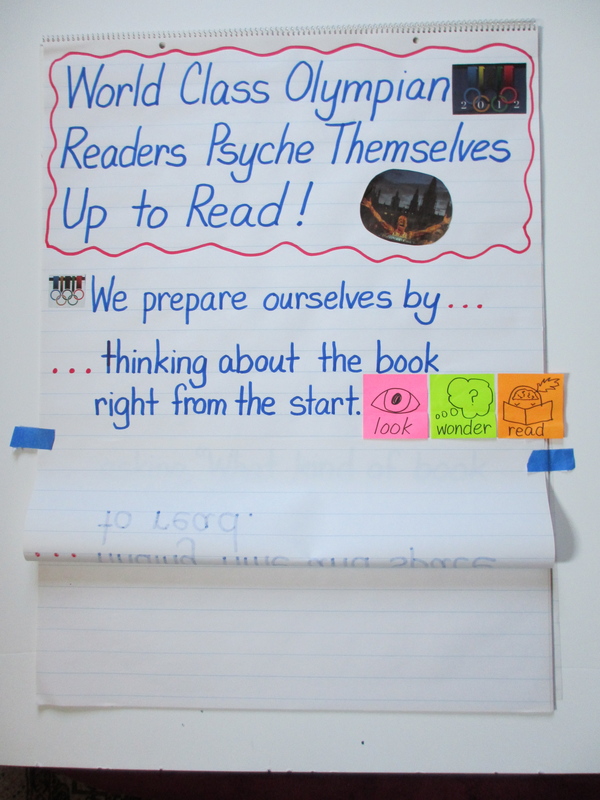 The small sticky notes were added as the teacher demonstrated each step a reader goes through to prepare to read any book. For example, readers prepare by “thinking about the book right from the start.” They do this by first looking at the front cover, title, and back cover. Then they wonder about what will happen or ask questions. Finally, they read with their minds on fire. Notice how each sticky note reminds readers of these steps. The “how” to do the strategy is added showing the steps involved. 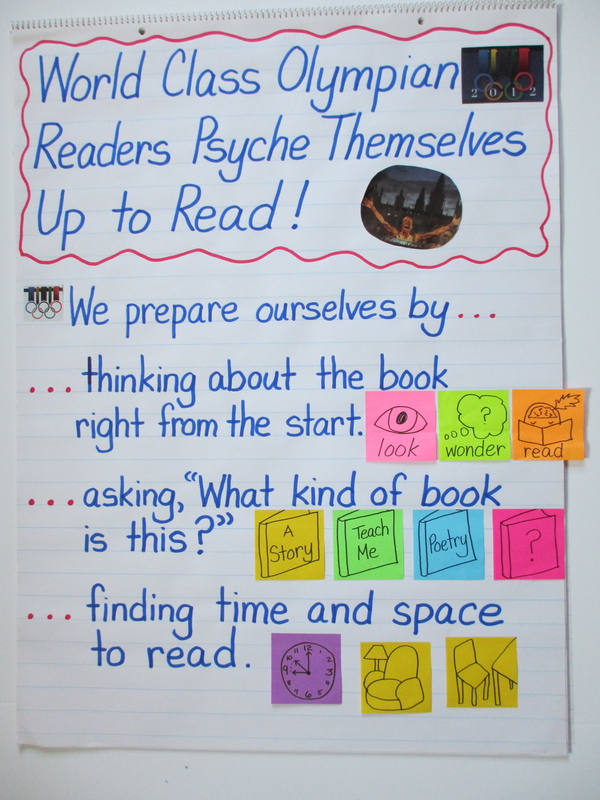 As the teacher explains how to think about a book right from the chart, she demonstrates how to do it with a book of her own, while adding the steps with icons onto sticky notes and putting those up on the chart next to the strategy. 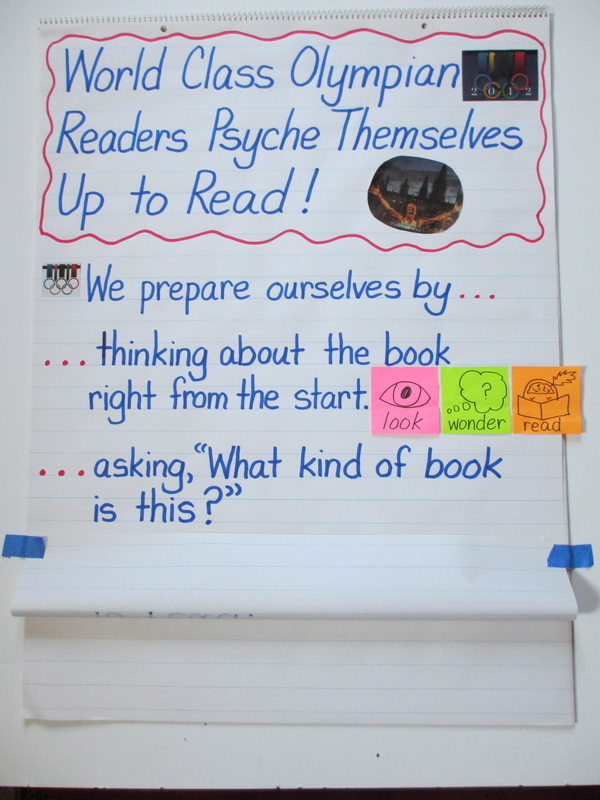 Each sticky note reinforces the teacher’s words and actions: look, wonder, read. The rest of the strategies and the steps involved are unwrapped as each one is taught explicitly by the teacher. The second teaching point is to ask, “What kind of book is this?” This strategy is important at the beginning of the year when children are reading a variety of books with various forms and genres. “Finding time and space to read” is another important lesson when you are trying to set children up to read with increased stamina and independence. And all along you can emphasize that this is just like what Olympic athletes do to build stamina and independence. Here is the chart with the second strategy shown. This is the chart in its final form. Now, you won’t always prepare a chart ahead of time. You need to consider your purpose, all that you want to include on the chart, and how you will use the chart to support your teaching. You can always go back to a chart and add photos or have children illustrate pertinent parts. But back to our Olympic theme. The Olympics can provide a fresh look at an old or familiar subject, such as partnerships. Partnerships take team work, and no place was that more obvious than at the Olympics. Whether you watched Beach Volleyball or Synchronized Diving you saw inspiring examples of athletes who worked together tirelessly and supported each other every step of the way. This is something our students can strive towards with their partnerships. 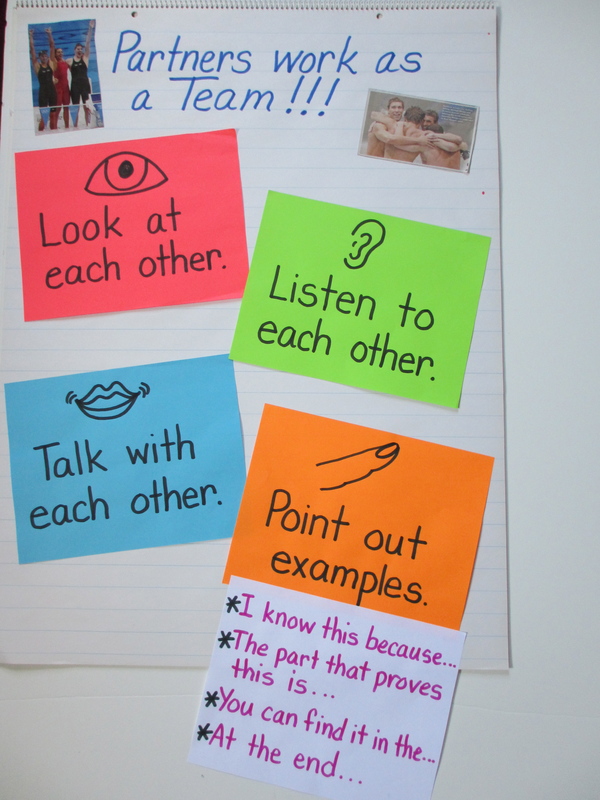 This idea of teamwork came into play when creating a chart around reading partnerships. Some photos of Olympic teams help illustrate the point. The heading, “Partners work as a team!! !” is meant to excite and engage in the prospect of working together with a reading partner. Partnerships are often challenging, so anyway we can generate enthusiasm for this essential element of any workshop, the better. Photos of kids looking, listening, and talking to each other can add another dimension to the chart. During another lesson, some specific prompts kids could use when trying to “point out examples” was added. Some sample prompts have been added to help partners provide examples as they talk. In addition to the amazing teamwork seen at the Olympics, there were many individuals who achieved extraordinary results through hard work and strategic planning. Michael Phelps was one very familiar figure the world watched intensely. Seeing him come back again and again, even after a few disappointing events, made him the poster boy for resiliency. He did not give up, so we had to include him on at least one chart so he could inspire a few of our upcoming writers. 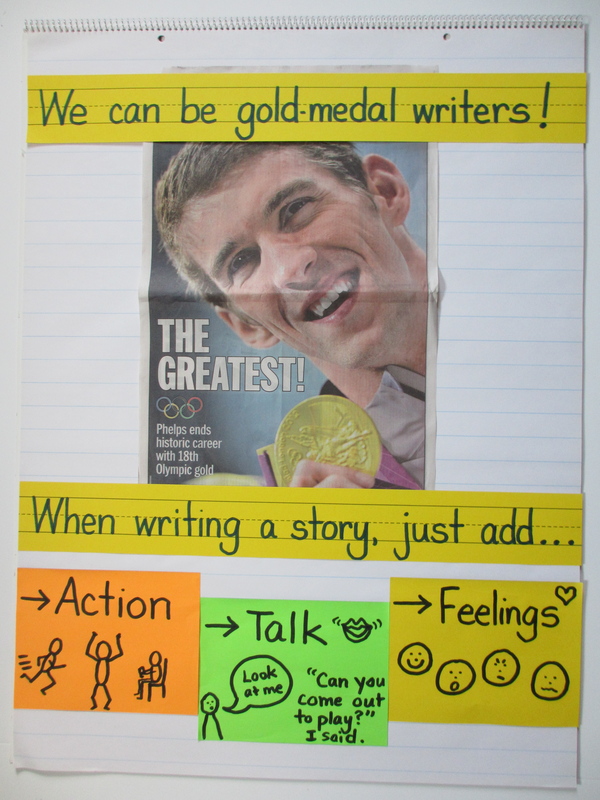 The metaphor of being a gold-medal winner is used to remind students what it takes to be a gold-medal writer. The 2012 Olympic Games provided us with two weeks of entertainment, but also showed us how to be in this world. The athletes approached each task as a challenge, saw failure as a chance to learn, and felt proud of their efforts that got them to London among all the other countries. Whether you use the Olympics or not, we know you will continue to find ways to inspire another generation of students excited to learn and try things out. And as always, happy charting! I love all of the references to the Olympics. 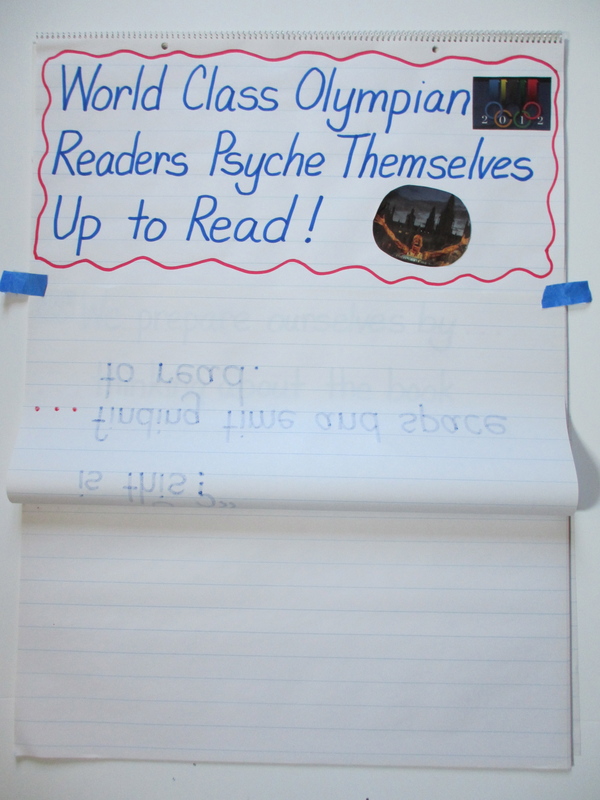 There are so many ways that the Olympics can be connected to reading and writing workshop! 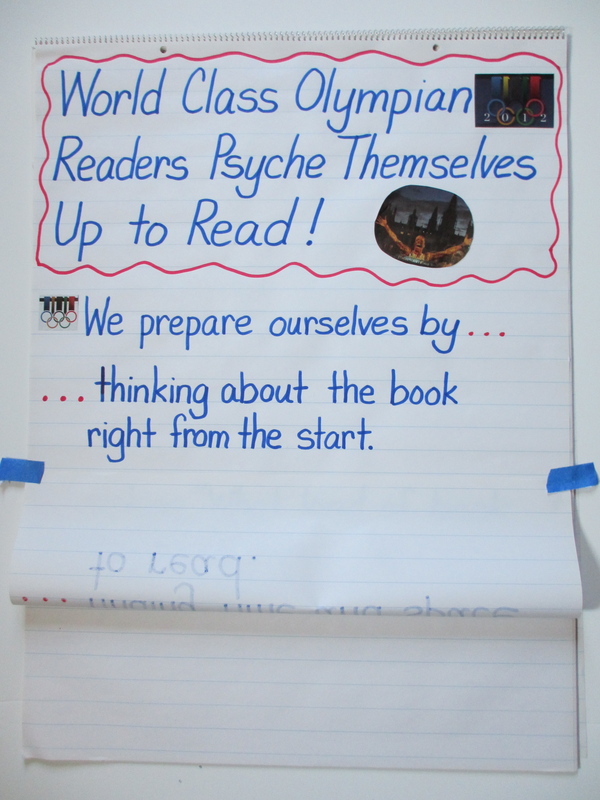 We would love to see how you use the Olympics to connect kids to reading and writing workshop! The chart needs a spelling error correction.